Aging and hearing loss: What’s normal? Hearing loss is common among Canadian seniors. The Canadian Hearing Society estimates that 60% of people over age 65 have some degree of hearing loss, and this figure is expected to rise as our population ages. Because hearing loss is so common among older adults, people often assume that it is an unavoidable part of aging, and that nothing can be done to prevent or manage it. If you think that you or someone you care about is experiencing hearing loss, it’s important to seek medical advice. Hearing loss can have negative, life-altering effects that are too significant to ignore. What causes hearing loss in seniors? The most common reason for hearing loss in seniors is presbycusis, which is caused by gradual, age-related changes to the inner ear (its structure, blood flow, auditory nerve or the tiny hair cells that pick up sounds) and/or in how the brain processes sounds and speech. This type of hearing loss is called “sensorineural hearing loss” and it tends to be permanent. Age-related hearing loss develops slowly, so people often don’t realize they have it. 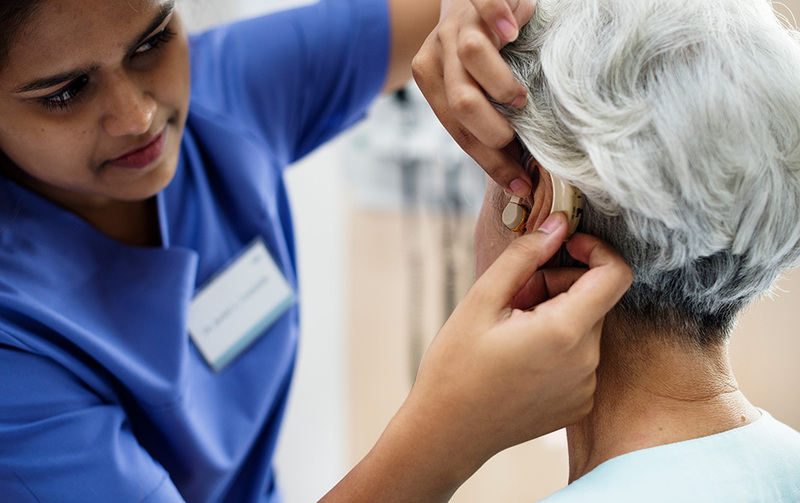 Research from the Canadian Health Measures Survey showed that nearly three-quarters of people aged 60 to 79 who had measurable hearing loss were unaware of it. It’s important to see a physician to determine the causes of hearing loss, since it may be related to another health condition. He or she may refer you or your loved one to an audiologist or an ear, nose and throat specialist (otolaryngologist). If hearing problems or deafness occurs suddenly, seek health advice as soon as possible – it could be a medical emergency. How does hearing loss affect seniors? Seniors who can’t hear well often suffer a decline in their quality of life. They may feel embarrassed, lonely, frustrated or distressed because of their hearing loss, and they may become socially isolated or withdrawn as a result. Hearing loss can affect how seniors interact with others. According to the National Institute on Aging, “Sometimes older people are mistakenly thought to be confused, unresponsive, or uncooperative because they don’t hear well.” People who are hard of hearing may also miss out on important information (such as safety warnings, alarms and directions from health professionals), and they face a higher risk of cognitive decline, dementia, depression, falling, and other health and safety issues. How is hearing loss managed? Depending on the causes of hearing loss, interventions could include surgery, hearing aids, cochlear implants, assistive or adaptive devices (telephone amplifiers, visual alerts and assistive listening devices for use in movie theatres, churches, etc. ), or learning lip reading or sign language. How can family members, friends and caregivers help?